Lock in a great price for Tube Resort – rated 9 by recent guests! Friendly staff. Good restaurant. Quiet, romantic vibe. Really nice rooms - cool design. Pristine location. Beautiful sand, crystal clear water. Staff work hard to please you and make your stay pleasant. Thanks to the staff. Cute idea for the rooms and they are spacious with a balcony which is handy. Gardens are nice and restaurant area pleasant. Quiet place to be. Everything was excellent! The place is idillic. The "tubes" are modern, big and comfortable. The staff is very kind and helpful. They always try to do their best. All the dinner menus were tasty and delicious. Excellent stay, super friendly managers and staff (special thanks to Andre and Laura but everybody is helpful), quiet part of island so if you are here to party better go somewhere else, a few nice places to snorkel easy accessible (amazingly huge corals, never saw something like this but won’t tell you where - the best time for snorkel is during the low tide), shallow water in the sea, perfect for children, delicious breakfasts and meals, in general place to chill and unwind in peace and quiet. 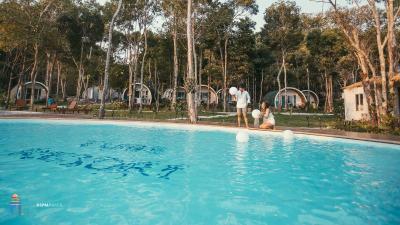 The resort is brand new, so the rooms are new, spotless and well equipped. The food is fantastic- the resort has a very talented chef- and cocktails are great too. The location is paradise- quiet, beautiful & unspoilt. The staff can't do enough to help. Just perfect. The food is great! Really, there is a good variety to choose from (aside dessert) and it tastes very, very good! 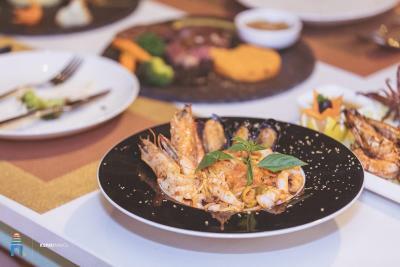 Outstanding for Asia is that they serve the dishes you order step-by-step. Not alltogether as it is very common. Water pressure in the shower is extremely good. There is warm water in the shower too. Bed is very comfy. The Staff is nice and very willing to help you, altough still under training (Resort opened 2,5 months ago). 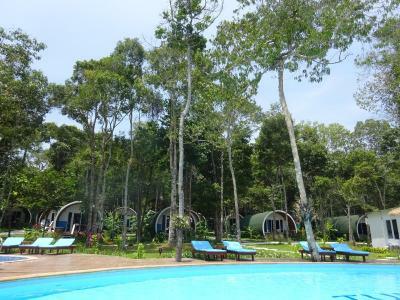 Perfect Resort for Holiday, Staff friendly and helpful, Room are big and clean with nice decoration. RECOMMED!! Tube Resort This rating is a reflection of how the property compares to the industry standard when it comes to price, facilities and services available. It's based on a self-evaluation by the property. Use this rating to help choose your stay! 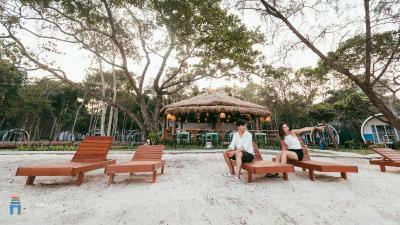 Located in Koh Rong Sanloem, Tube Resort has a private beach area. 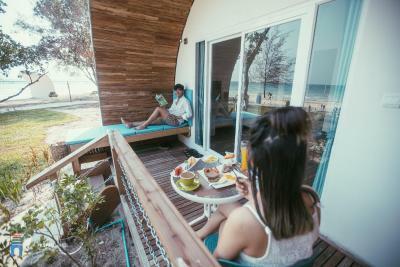 Each room at the 4-star hotel has sea views and free WiFi. The hotel has a garden and provides an outdoor swimming pool. At the hotel, the rooms are equipped with a terrace with a pool view. 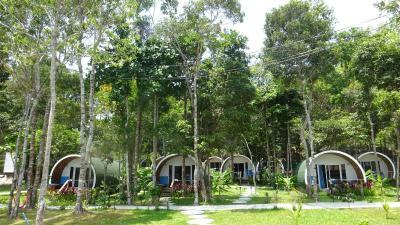 All rooms include air conditioning and a flat-screen TV, and certain units at Tube Resort have a garden view. Guest rooms include a seating area. 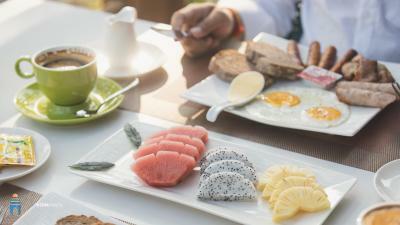 A continental breakfast is available each morning at the accommodation. 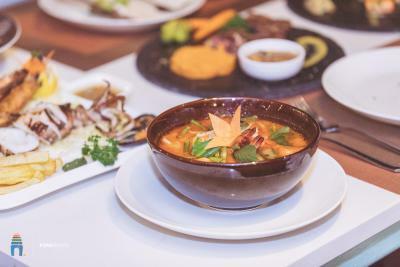 Guests can enjoy a meal at the on-site restaurant, which specializes in Mediterranean and Asian cuisine. 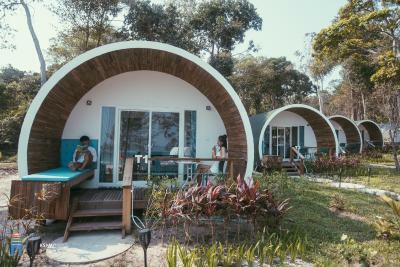 Guests at Tube Resort will be able to enjoy activities in and around Koh Rong Sanloem, like hiking. 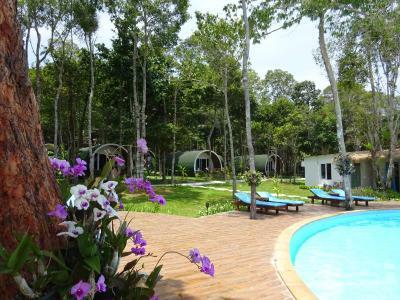 Sihanoukville is 4.2 miles from the hotel. Sihanoukville International Airport is 14 miles away. 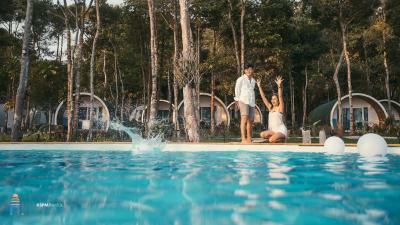 This property is also rated for the best value in Koh Rong Sanloem! Guests are getting more for their money when compared to other properties in this city. 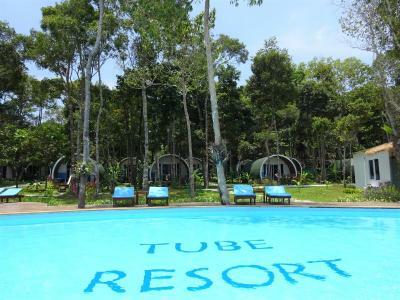 When would you like to stay at Tube Resort? House Rules Tube Resort takes special requests – add in the next step! Tube Resort accepts these cards and reserves the right to temporarily hold an amount prior to arrival. Western Food choices better then local food although I prefer local usually. Some food items a bit pricey ( Western Food) but understand food comes from a long way. Khmer food reasonable price but can vary in tastiness. Would like to see more shade shelters on the beach like the tube or perhaps bamboo shelters. The property is run by generators so there may be periods of the daytime when aircon in rooms not available ( usually when you’d be swimming anyway) but internet is always on and strong. 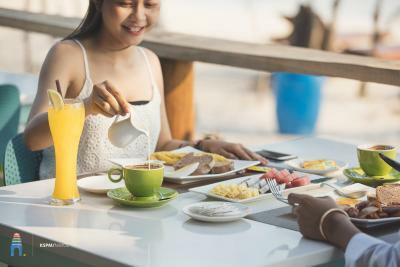 Maybe You should enrich the supply of the breakfast with European food. 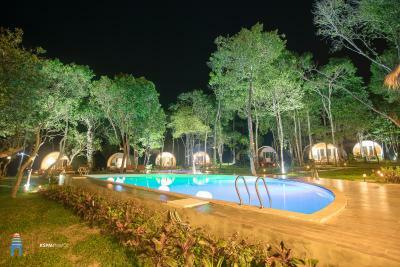 There are trees around the pool, so quite many leaves falling down, it would be nice to clean the pool area more often. The beach in front of the resort is perfectly clean but a few steps to the left on the beach and in the water there are some debris from the construction works (like bricks), some of them quite sharp, I realise that it is not the part of the resort but it would be safer to clean them out, otherwise resort guests might cut their feet one day. I gave them my washing to do. The lady I gave it to thought it would be about 2kg in weight but they said it was 5kg which they immediately changed to 6kg after I had given them my (dry) bikini. When I received the washing back the next day, most of my clothes had shrunk and were too small to wear. Some of them were recently purchased and I lost hundreds of dollars worth of clothes. When I told this to one of the managers, ‘Sunny’, his response was to shrug his shoulders and to tell me ‘it’s an island’. The owner told me they only used a cold wash and when I told him that half of my clothes were now too small for me, he said ‘what do you want me to do about it?’ And looked completely uninterested. The day I left,Sunny allowed the boat to leave without me so that I missed my connection and then blamed me pretending I had told him I was going to stay another night. He then changed this excuse to how I had missed it due to being too late for it (which I was not, I had been ready with my bags packed in plenty of time). When I told him that he had been rude to me several times now, he grinned. I explained all of my frustrations to a French employee, explaining how much money I had lost from cancelling on clients and from losing half of my clothes. I told him that if they had just given me some warning of when the power cuts would be I could have re-scheduled with people. He became abusive, gas lighting me, telling me he was going to shrug his shoulders too because I was ‘screaming’ when I had not raised my voice beyond normal speaking volume. When I pointed this out and told him he was being unprofessional, he said ‘you don’t probably care about our generator problems’. When I told him that this wasn’t my job and that it was his job to care about customers, he shrugged his shoulders. Another member of staff managed to get them to agree to give me a 20% discount on my bill but was sent back to me with the message from the French guy that I had been too angry to listen! I had stayed just a week and a half before for 4 days and it was pleasant, the sea is a beautiful. But this time, nothing worked. There is not enough room so I will start to explain about how nothing worked here: There is no hot water in the showers, my safe didn’t work, my kettle didn’t work. They only cleaned my room once the whole week I was there. There is rubbish on the beach and the sea hammocks had tipped over and several days later they had still not been repaired so that you couldn’t use them. I had emailed ahead to check the internet was working well and explained I needed it for my work (in order to do Skype consultations). There were power cuts several times a day and during the nights, for 4 of the days I stayed there and only on one occasion was I warned about them. I had to cancel 4 different Skype appointments with my clients at the very last minute, with no notice at all, because I was given none. At first I thought the power cuts were out of the hotel’s control but the night before I left, I learned each one was planned (to allow their generator to rest). Only one member of staff, a South African guy who had only been working there for 2 weeks, was always professional, showed understanding and actually warned me once that a power cut would happen soon. Every night in the middle of the night there would be another 2 hour long power cut which woke me because it became so hot in my room. I got more and more run down on little sleep. Either the food (which was mostly overcooked seafood/fish) or the ice gave me a bad stomach for the whole week I was there. I had gone back to the resort because of the beautiful location, as I had planned to record videos for a course I’m teaching, but every single time I tried to make room on my phone to record by downloading onto my computer, after half hour of waiting (slow internet), there would be another power cut and the download would suddenly fail. So I never managed to record a single video. Hose for/at toilet way to powerful, needs a valve. We had originally booked for 2 nights but because we loved it so much we booked an extra night. They did not have the same tube/room we were staying in available for the third night so we stayed in a room that was further back. Although it was still nice and we had access to the same facilities, it was not the same as having a room facing the sea. We had an amazing stay here at Tube Resort. Crystal clear water , white sand , lovely pool and rooms - pure paradise ! The food was also delicious and couldn't ask for nicer staff also. They were extremely friendly and always smiling. I would stay here for a month if I could. Very great hotel, comfy and quiet rooms. The beach is amazing and the staff very welcoming. One of the manager is this cool and helpful French guy, speaks perfect English too, which can be useful. I really had a great stay at the Tube Resort ! No local village on this portion of the island. However, it’s only a short boat ride to the main beach. The resort still have a bit of building at the back side but it doesn't bother me much. The only negative was getting there and back from the mainland! The ferry is quite packed and the ride can take a while because there can be other stops where people are getting on and off. It is very cheap however so can't really complain. You get your own private tube building with everything included that you could need! For water and anything else you might need, all you have to do is ask and they will get you it. The service is amazing; all the local Khmer people are so nice and hard working. There is also English staff around that you can talk to and ask any questions. Trevor is one of the managers there who spoke English and he was such a tremendous help in making our experience the best one possible! The staff can help you set up any tours or activities, like snorkeling, scuba diving, etc. 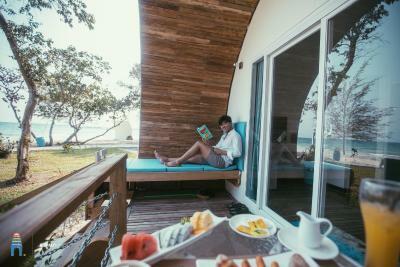 The resort also has a private little boat which they can use to take you to Saracen Bay to experience other restaurants, hike the trails, or just change up the vibe. 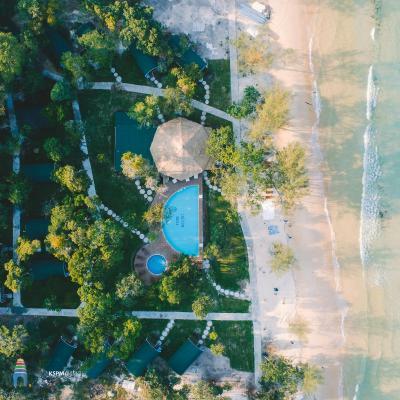 The seclusion of the resort is amazing; there's only one other bungalow place on the other side of the beach, and most of the time it feels like it's just you and you have the whole beach to yourself!